LAS VEGAS – Inside a building full of tempting table games, Conor McGregor wasn’t about to tip his hand. A reporter put the UFC superstar on the spot Wednesday by asking him if he would bet on himself against Floyd Mayweather Jr. And if so, the reporter probed, how much? The question was perfectly appropriate, considering Mayweather reportedly planned to place a $5 million bet on himself to beat McGregor on Saturday night at T-Mobile Arena. The incredibly confident McGregor gave an uncharacteristic answer, choosing instead to mock Mayweather’s well-documented gambling habits. Besides, why would McGregor gamble when he already hit the lottery? McGregor can cash in his ticket Saturday night after he fights Mayweather in what was once a laughable longshot, a preposterous proposition not many people other than McGregor believed eventually could become reality. After all the pay-per-view, gate and additional revenue is calculated, McGregor could earn more than $100 million for what amounts to a complete mismatch that never should’ve been sanctioned as more than an exhibition by the Nevada State Athletic Commission. Mayweather said during their over-the-top press tour last month that his business decision to return to boxing to fight McGregor will be studied one day at Harvard Business School. That’s not far-fetched when you analyze the low-risk, high-reward nature of Mayweather’s 50th professional fight. But if they study Mayweather’s move at Harvard, they should examine McGregor’s maneuver at Oxford. In the Irishman’s first boxing match, a fight he has next to no chance to win, McGregor could earn what it would’ve taken him 10 huge UFC pay-per-view main events to make. Given the short shelf lives of those that thrive at UFC’s elite level, it’s highly unlikely that the 29-year-old McGregor would’ve been afforded 10 such UFC paydays. 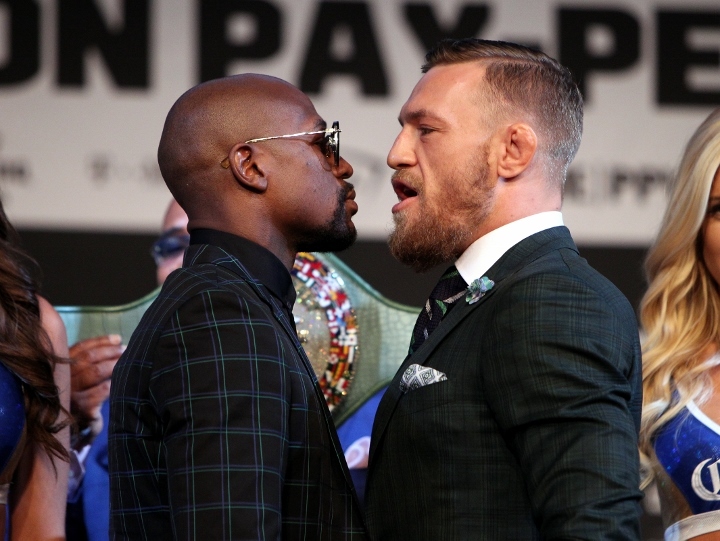 Even if Mayweather-McGregor underperforms on pay-per-view, McGregor still will walk away from his first professional boxing match with more money than two tremendous, undefeated boxing stars – light heavyweight champion Andre Ward and middleweight champion Gennady Golovkin – have combined to earn during their entire careers. If that’s not business brilliance, what is? More than anything else, the brash showman’s persistence and unbelievable ability to self-promote is the reason this event is expected to exceed the $600 million or so in revenue that the Mayweather-Manny Pacquiao fight generated two years ago. Remember, Mayweather wanted nothing to do with this fight at first, and understandably so. He turned 40 six months ago and, with his health and wealth well intact, was enjoying retirement. And it didn’t look like there was much to gain by entertaining the idea of fighting a boxing novice, no matter how big a star McGregor had become in UFC. McGregor made sure, though, to keep taking shots at the boxing legend, both in public and through social media, to see if Mayweather would take the bait. As the idea of this unusual spectacle began building momentum, Mayweather warmed to the idea because he realized he might be able to make money comparable to his unprecedented take from the Pacquiao fight (nearly $300 million). Persuading Mayweather wasn’t the only upset pulled off by McGregor. He also had to convince UFC president Dana White to sign off on allowing him to step out of the Octagon and into a boxing ring. That might’ve been more difficult than swaying Mayweather. Somehow, impossible became a done deal and here we are, a day away from Mayweather boxing someone he probably didn’t know existed two years ago. McGregor is unquestionably UFC’s biggest star at the moment, someone White needs more than ever now that ever-embattled Jon Jones just got popped for failing a PED test and Ronda Rousey’s MMA career is ruined. The last thing UFC needs Saturday night is for Mayweather (49-0, 26 KOs) to dominate and/or knock out its cash cow, even though he obviously is supposed to lose. For McGregor, however, this isn’t about UFC’s brand or MMA’s credibility. It’s about setting up his newborn son’s children for life. McGregor might truly believe he’ll be able to accomplish Saturday night what 47 professional boxers, including numerous champions and former champions, failed to do against the best boxer of this generation. That won’t matter once he encounters boxing skill, speed, experience and intelligence he hasn’t come close to facing in an MMA match. The inevitable result won’t matter, either. If Mayweather beats him badly Saturday night, McGregor has already won. He went from fighting before roughly 500 people in London five years ago, before he signed with UFC, to taking part in what’s being billed as the biggest combat sports event in history. If McGregor manages to get extremely lucky and lands a shot that shocks the world, his win would supplant Buster Douglas’ demolition of Mike Tyson as the biggest upset in boxing history. Douglas went off as a 42-1 underdog when he upset Tyson 27 years ago in Tokyo. Mayweather was just slightly more than a 5-1 favorite at MGM Grand’s sports book Thursday night, but that’s only because so many MMA fans and other opportunists have placed bets on a huge underdog. McGregor didn’t sound eager to join them when asked if he will bet on himself. Then again, who could blame him? Why would McGregor gamble when he already hit the lottery?